Never Learn was produced by The Devil Makes Three and recorded by Gary Martin at Mother Earth Recording. The song, they note, "is about capitalism in the broad sense and also about labor history." With a slightly punky perspective on vintage American blues and old-time music, The Devil Makes Three is a breath of fresh musical air. 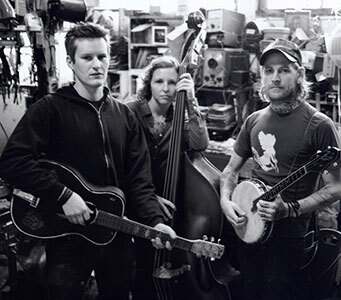 Laced with elements of ragtime, country, folk, and rockabilly, the critically praised, drummer-less trio – consisting of guitarist/frontman Pete Bernhard, stand-up bassist Lucia Turino, and guitarist Cooper McBean – take a genuinely fresh and rhythmically energetic approach to acoustic music. "The rhythm is what our band is about," Bernard enthuses. "We write with rhythm and dancing in mind." "I grew up listening to a lot of old blues music when I was young," explains Bernard, who was raised in rural Vermont and befriended McBean in the eighth grade. "He was the only person I knew who was into the same style, although he leaned more toward the country side of things. When we started out playing, we were doing punk and rock." Fast forward a decade and The Devil Makes Three took shape in Santa Cruz, California. Bernard moved west right out of high school with McBean soon following suit. After playing in an ill-fated band in Olympia, WA, McBean – who by now had the name of his home state tattooed across his neck – again joined musical forces with Bernhard. In turn, they later teamed with New Hampshire-native and U.C. Santa Cruz student Turino.